What is it about London’s railway arches that makes them such a hotbed of culinary activity? In Bermondsey, of course, there are the renowned Maltby Street and Spa Terminus markets; and we’ve already told you about Mexican cheeses made under Peckham station. New restaurants, bars and pop-ups seem to be, well, popping up under some railway arch or the other every day. 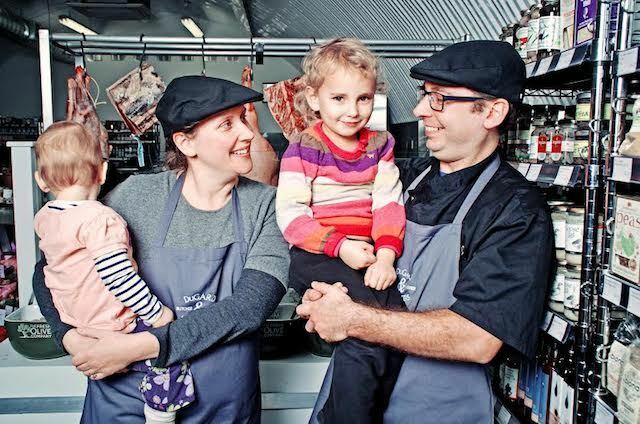 More recently, Duggard & Daughters family-run butcher and deli opened under Herne Hill station’s arches. The location is not immediately obvious: as you come out of the station’s main exit, turn right, then take a sharp right again under the tunnel, and then another right turn will take you to the spacious, 1000 square feet space. “Yes, customers are surprised to find us here. Most other businesses are not yet open”, say owners Neil and Rosie Dugard. The shop is billed as a ‘butcher and larder’, with the emphasis on the former. “Meat is what most people will travel for – what makes us a destination”, says Rosie. The meat is English, rare-breed and free-range; and all the beef is dry-aged for up to five weeks in a chiller at the back of the shop. There’s Gloucester Old Spot pork from The Rare Breed Pig Company, salt marsh lamb from Foulness Island in Essex, grass-fed beef from small cattle farms around the UK, and Fosse Meadows Farm free-range chicken. Due to customer demand, they’ve also introduced acclaimed organic chicken from the Black Mountain region of Wales. The Dugards buy animal carcasses and not individual parts, explaining that these have “less integrity”: with a whole animal, you know where it has come from. “We cook our family dinner every evening using our own meat, so people can trust us”, says Rosie. So, although individual portions and choice cuts are available, you won’t be able to buy, say, chicken wings or thighs in bulk for a party, like in a supermarket. “No, we don’t sell the same as supermarkets”, they emphasise. On the large meat counter running along one side of the shop, you’ll find rose veal escalopes, beef oxtail, whole duck, Cannon & Cannon British charcuterie, and fresh meat stocks. There are own-made lamb merguez, pork and leek, chicken, and other varieties of sausages (£8.99-£9.99 per kg) flavoured with organic fresh herbs. Additionally, they make mince from rare-breed, free-range beef (£7.99) and salt-marsh lamb (£9.99). In a nearby chiller cabinet, you’ll find Norfolk quail, chorizo, duck confit, terrines and beef dripping, too. Tastings of meat cooked on a portable hob are also offered, mostly at weekends. We think the ‘larder’ bit of their name is equally important, though. Dozens of shelves are lined with pastas, tea, coffee, jams, honeys, biscuits, crispbreads and snacks, mostly sourced from around UK. Everything is impeccably well organised, with no sense of chaos or clutter. There’s a large display of olives from The Fresh Olive Company by the entrance; and ‘healthy’ ingredients to one side, such as Hodmedod’s excellent British-grown black badger beans and kabuki peas (£2.05 - £2.83), Wild At Heart pickled samphire (£4.46), Liberty Fields apple balsamic vinegar (£4.99), Scarlett & Mustard's deliciously unique dill oil (£4.49) and Organico Nerone black rice (£4.55). Over in the many chiller cabinets, you'll find Folkington’s juices (£3.99), Mr Fitzpatricks cordials (£4.15), Longley Farm buttermilk (£1.29), Smoke & Pickle fresh soups (£3.49) and cheeses like Old Shire cheddar and Five Counties English cow’s cheese from the wholesale supplier Anthony Rowcliffe. At the back, among the huge selection of condiments, there’s Hawkshead Relish’s nettle jelly, and Bim’s Kitchen range of spicy African-inspired sauces (£4.92). Some half a dozen shelves are stacked with a comprehensive range of Steenbergs Organic herbs and spices (£2.35-£3.25). Products change seasonally and regularly, based on customer demand. “We can usually get in specially requested items pretty quickly”, says Neil. With their combined experience of food retail management – Planet Organic (Neil) and Budgens (both Neil and Rosie) – the Dugards had always wanted to open their own food shop. They nurtured a business plan for seven years, but already had good jobs so weren’t in a rush to change. During this time Rosie gave birth to their two daughters – the daughters of the shop name. In 2012 they were both made redundant one after another, which gave them the incentive to kick their plan into action. With young children to look after, it wasn’t easy at first: the negotiation with Rail Track progressed slowly over a year, generating a lot of uncertainty, before they were handed the keys last summer. There was much work to be done on the premises in the meantime; and they narrowly missed the Herne Hill flood. New to running a business that includes managing a staff team of five, they’re now proud of what they’ve achieved – as they should be. A quirky location it might be, but Dugard & Daughters is just the sort of good, solid, reliable, family-run butcher and deli that every neighbourhood should have. Railway arches optional. Dugard & Daughters, Arch 286 Milkwood Road, Herne Hill SE24 0EZ. Tel: 020 7733 2608. Note: businesses featured in this series are chosen editorially, and not as part of a promotion.